Peter first played in English Premier League when he was 22. Over the last decade or so, we have seen some of Africa’s top footballers light up the English Premier League. They have come, they have seen and they have conquered. Some of the most iconic moments in premier league history and world football history have been moments of brilliance by African players. JJ Okocha’s cornerflag flick over a defending player comes to mind. The world cup defending French team being knocked out of the world cup by Senegal in 2002, or that Ghanaian team that posed a threat to footballing greats at the 2010 world cup. Last but not by any means least, Didier Drogba’s last grasp equiliser that stole the champions league cup from Bayern Munich, to give Chelsea their only champions league cup thus far. Or the moment he slotted in the last penalty in that game. We could go on and on. In all of the conversation that we can have concerning this, there is one man that seems to have been forgotten. I’ll remind us all. Peter Ndlovu was the first ever black African player to sign for and feature for a team in England’s top flight. While he was playing for Highlanders Football club in Zimbabwe, Ndlovu was spotted and scouted by John Skillet. Terry Butcher finally got Ndlovu’s signature and brought him to England to feature for the Blues. In his debut season, Peter made 32 appearances and scored 7 goals, at a rate of a goal every 325 minutes or every four games or so for his whole career average at Coventry. 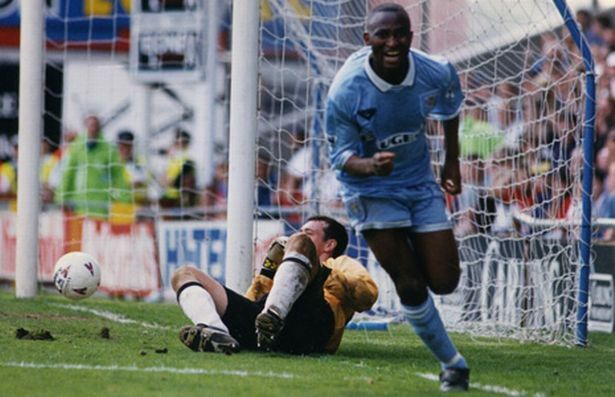 Peter Ndlovu or Nuddy, as he would affectionate become known to the blues fans stayed with Coventry for 6 years. His greatest moments in that period would come against Liverpool at Anfield where he was the first and only player to score a hat trick away to Liverpool on the 4th of March 1995. His record would last 14 years, until it was broken by Arsenal’s Andrey Asharvin in April 2009. Unfortunately, this was to be his only hat trick for the club. His club debut came against Tottenham Hotspurs on the 19th of August 1992, in a match that he featured for only 20 minutes. His first starting and full-time match came away to Sheffield Wednesday on the 2nd of September 1992. This also coincided with his first goal for Coventry City. The Blues fans began to get excited about their new boy. His blistering pace and darting runs made him a tough customer for most defenders. Peter Ndlovu (born 25 February 1973) is the first African Footballer to play in the English Premier League. He is a former professional Zimbabwe footballer, and currently serves as the Team Manager at South African top-flight football club, Mamelodi Sundowns F.C. Peter Ndlovu hails from Siabuwa, Binga district in North Western Zimbabwe, but was born in Bulawayo. He played professional football as a striker from 1988 until he retired in 2011. He began his career with Highlanders in Zimbabwe, played for Coventry City in the Premier League and also in the Football League for Birmingham City, Huddersfield Town and Sheffield United . While in South Africa, he played for Mamelodi Sundowns F.C, Thanda Royal Zulu F.C, Highfield United and finally Black Mambas. He earned 100 caps for his country, scoring a total of 38 international goals. Ndlovu was originally scouted by John Sillett , before he officially signed for Highlanders via Terry Butcher’s influence in July 1991. He made an instant impact by scoring away at Arsenal and soon became the toast of Highfield Road, with a thunderbolt winner against Aston Villa in November 1991. This endeared him to the Sky Blues fans. He is particularly known for his singular contribution to Coventry City’s top flight status at that time. On Wednesday 19th August, 1992 at age 21, Peter Ndlovu made history as he officially became the first African footballer to feature in the English Premier League. He partnered with legendary striker Micky Quinn in November 1992, and they continued what had already been a wonderful start, with an impressive home win against Middlesbrough (2–1). By early autumn Coventry City briefly topped the inaugural Premier league. Ndlovu played a key role throughout the season in Gould’s fast paced front line which had the likes of John Williams, and Kevin Gallacher ( he later departed to Blackburn). Peter Ndlovu’s goal against Norwich City, during a one-all draw in late September, was a signature piece of Ndlovu flair which earned him the Match of Day ‘Goal of the month’ competition. He became known as ‘Nuddy’ by Coventry City fans. Ndlovu was eventually signed to Birmingham City in July 1997, by Trevor Francis for £1.6m. After a loan spell with Huddersfield Town in 2000, he left for Sheffield United in February 2001. 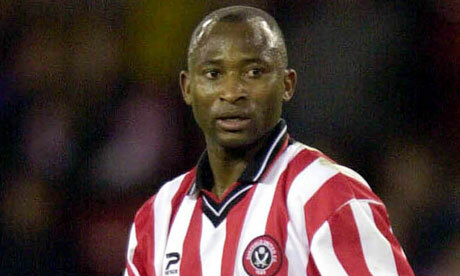 Ndlovu enjoyed much success at Sheffield United, and was also known to their fans as ‘Nuddy’. In all, Ndlovu scored over 90 goals during his 12 seasons, garnering about 338 appearances in the top two flights of the English football league. Ndlovu later got signed to South African Premier Soccer League outfit Mamelodi Sundowns during the 2004 off-season. Ndlovu was released from his contract by Thanda Royal Zulu at the end of 2008–09 after they were relegated from South Africa’s top division. He then stayed for two years without playing football. Peter Ndlovu had a sterling international career. He came into limelight as an under-23 player at the All Africa Games in Egypt. He earned 100 caps for the Zimbabwean national team over a 15-year period. Ndlovu is on record as the all-time leading scorer for Zimbabwe. He single-handedly led his nation to qualification for her first ever African Cup of Nations, in Tunisia 2004. In 2011, Ndlovu was named the assistant manager of the Zimbabwe national football team. After he recovered from the accident which killed his brother Adam, he remained for a short while as Zimbabwe Under’s 23 coach and also Assistant Coach for the national team. Peter Ndlovu was later called back by Patrick Motsepe in July 2013 to Mamelodi Sundowns, as a Manager. Peter had brothers, Adam and Madinda, who were also international players. The trio played amateur football on the streets of Makokoba, Zimbabwe, where they grew up. Peter played for his hometown team, Highlanders, before joining Coventry City in 1991. Throughout his career Peter Ndlovu’ surname was commonly mispronounced by British commentators and fans, as ‘Und-luv’ instead of ‘End-lo-vu’. On 16th December, 2012, close to the Victoria Falls Airport in Zimbabwe, Ndlovu’s BMW X5 suffered a tyre blow out, causing it to come off the road and hit a tree. Ndlovu was left in a “critical” medical condition in hospital, while his brother Adam and a female passenger died. Ndlovu faced trial, in March 2013, for culpable homicide; the prosecution claimed he was culpable for failing to control his car properly. He was later acquitted in April 2013, with the court citing a lack of concrete evidence to prove Ndlovu’s responsibility. Depending on what generation of football fans you ask, Peter Ndlovu is arguably the greatest Zimbabwean football export ever. The older generations will tell you its Tauro, Chunga, Shaya or a host of other stars that featured in what was dubbed Zimbabwe’s dream team. One player that had more success and merits a place ahead of Ndlovu is probably Bruce Grobbelaar. Grobbelaar’s success with Liverpool in the league, the champions cup, the FA Cup and the Super Cup puts him ahead of Ndlovu. If one is to only consider merits achieved while featuring for the national team, no one beats Ndlovu. He captained and led Zimbabwe to its maiden and second appearance in the Africa cup of nations. He was their top scorer in the qualifiers as well as in the tournament itself.